Slice the salmon thinly. Lightly butter a deep dish. Slice the potatoes into ½-cm slices. Layer the potatoes, salmon, onion and dill in the dish, ensuring that the top and bottom layers consist of potato. 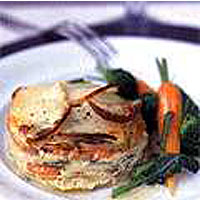 Whisk together the egg and milk and season with white pepper, then pour the mixture over the layered potatoes. Bake in an oven preheated to 200°C/gas mark 6 for about 45 minutes. Serve with clarified butter, steamed broccoli and carrots.